What Is The Average Salary That Fresh Grads Can Expect In M'sia? Can Fresh Grads Only Expect RM2.5k For Their First Job? The Data Says Otherwise. It is often said that fresh graduates on average, earn approximately RM2,500. We surveyed the salaries of some of the most popular jobs on Jobstreet to see if this approximate figure held true. The results show that many of the more popular industries can offer fresh graduates at least RM2,500, but this is very industry-specific. If you’re reading this article, then we don’t need to tell you how difficult it is to get a job as a fresh grad. Fortunately, the outlook looks better for 2018. But, there’s something else to think of. While it’s fair to say how much someone is paid depends on the value they add to the organisation, I think that employees—no matter how fresh or low-ranking—deserve to be paid a living wage. A living wage here means jobs that can sustain at least a basic human existence: rent, student loans, food, transportation, and some basic entertainment. Some would argue that RM2,500 (said to be the average for fresh graduates) can’t sustain all of these anymore thanks to rising costs. Of course these aren’t just dictated by a company; a country’s laws, norms and the socioeconomic situation can dramatically impact the minimum wage “deserved” by a fresh graduate. In fact, certain industries pay even lower than that for jobs that require at least a degree. So we decided to put this number of RM2,500 to the test. 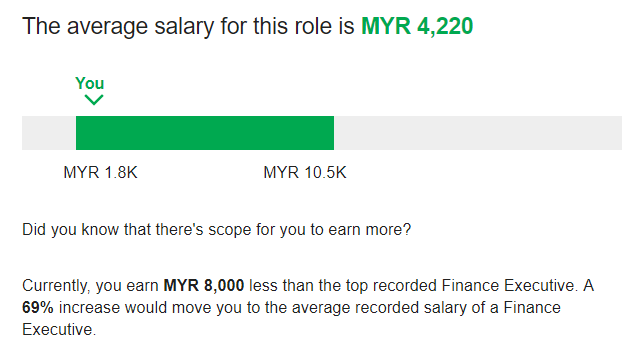 Using Jobstreet’s new Career Insights analytics, we punched in the RM2,500 fresh graduate salary for a few popular jobs in Malaysia to discover how this number compares to actual salaries paid in Malaysia. Do note that the average shown on Jobstreet shows the average for everyone in the role—fresh graduates AND experienced employees. So the actual pay range for fresh graduates would probably place among the lower scale of the values shown. 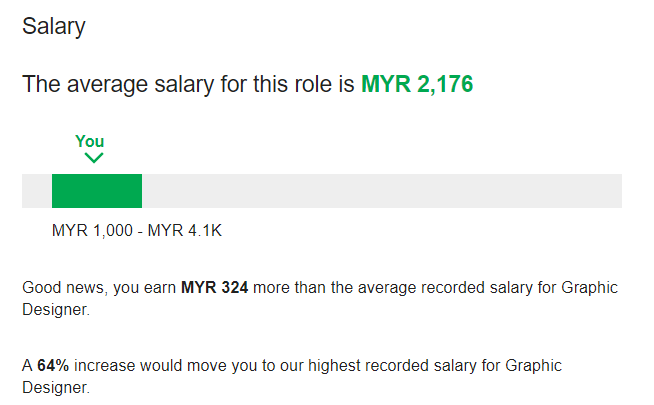 Based on Jobstreet’s record, it could be feasible for fresh graduates to ask for an RM2,500 salary for their first job, though it seems like they will have to prove their worth to employers first. However, it doesn’t seem like graphic designers can stand to earn much more than that once they do gain experience. Another interesting fact is that turnover seems high. 67% of graphic designers on Jobstreet’s database have spent less than 2 years with their current employer. RM2,500 for a customer service executive is higher than the average salary. Perhaps since it is less technical work and is a skill that can be trained up internally, the salary isn’t very high. As to be expected, 68% of Jobstreet’s recorded employees have stayed with their current employer less than 2 years. Parents might have a point when they told you to go into accounting, though not as much as they’d hope. There are accountants earning as low as RM1,200. But it seems like accounting fresh graduates have the grounds to ask for more from their employers since the average salary is actually RM4,300. And up to 58% of employees have only been with their employer for less than 2 years too. Therefore, we can’t imagine that RM3,500 would be too difficult to ask for. The results of a finance executive seem similar to an accountant. The average salary is RM4,220, and 53% of employees have been with their current employer for less than 2 years. Therefore, it does seem possible for a fresh graduate to gun beyond the average of RM2,500 for their first job. Surprisingly, it seems like fresh graduates who enter the competitive world of sales don’t stand to earn much more than the “average” fresh graduate salary. The average salary for a sales executive stands at RM3,315. And considering 62% of its current employees have been with the company for less than 2 years, it is pretty safe to assume that this is more or less the fresh graduate salary too. To be fair, this monthly figure does not seem to take into consideration the fact that many sales jobs are paid based on commission. It seems like there are more business development executive roles these days, especially where big data is a big deal, and e-commerce sales seem to be approaching its peak. And those in the business development role stand to earn more than the average fresh graduate salary too. When you combine this with the fact that 64% of employees have stayed less than 2 years, it is pretty feasible for a fresh graduate to ask for RM3,500 to RM4,000. And if they perform well at their roles, they can even ask for more down the road. It’s time to look at the engineers, one more branch of the Asian trifecta of desirable jobs. The development of the MRT project has been good for the engineering industry in Malaysia, and this seems to reflect in the wages that engineers stand to earn. Even if you consider that most employees in this role have only been with the company for less than 2 years (67% of them), project engineers still earn an average salary of RM3,400. Considering between the number of people who have only been with the job for less than 2 years versus the average salary, this is another industry where it seems feasible for fresh graduates to ask for at least RM2,500. That being said, depending on one’s skillset and experience during their internship, etc, they seem to potentially be able to ask for more, though we’re not sure if it can go beyond the RM3,000 cap. It seems like interior designers in Malaysia are at a bit of a disadvantage when it comes to asking for more than RM2,500. Again, more than half of the employees (68%) have stayed in the job for less than two years so the average seems pretty indicative of what a fresh grad could potentially ask for. And that value, apparently, stands at RM2,696. This is another case where there is the possibility that interior designers with more than 2 years’ experience move up to Senior Interior Designer, so career-wise, there seems to be a possibility for higher increments. But as far as fresh graduates go, the results seem a little slim. Those working in IT can also stand to ask at least for RM2,500, though in this case, they may have to prove to a potential employer why they could earn that salary. Only 55% of employees working as IT executives have been with their role for less than 2 years. Meanwhile 19% of employees have been with the job for 3 to 5 years. And another 19% have stayed with the job for 6 to 9 years. This might go to show that fresh graduates can probably expect a decent salary, but in terms of increments, they might have to move up to different roles to earn better salaries in the future. For example, a Software Engineer in IT stands to earn, on average, RM4,583. And the highest recorded salary they can record in a software engineer role is RM13,300. Up to 72% of audit assistants have only been with their job for less than 2 years, and a cursory glance of Jobstreet indicates that this is a fresh graduate-friendly job. 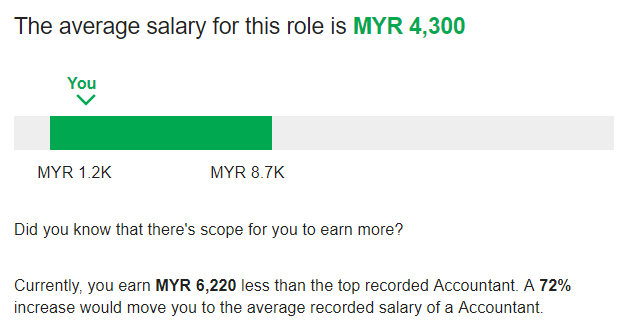 This is perhaps why the average salary for this role is only slightly below the RM2,500 range. The good news is that after being an audit assistant, many employees move up to becoming account executives, who on average earn approximately RM3,000, though salaries can go up to RM5,000. You may have heard the typical convention that those studying in communication-related degrees don’t stand to earn too much money, and to be honest, that convention doesn’t come from nothing. That being said, the results do show that fresh graduates can feasibly expect RM2,500 still, especially since of those employed, 64% have only been with the company for less than 2 years. Based on our little dive, the results seem to tally with the industry trends as of 2017. Jobs relating to IT, sales, finance and e-commerce showcase better possibilities of good salaries, though how much you stand to earn does vary. The same list names construction as one of the industries to be cautious about last year, even though it seems like there is a lot of potential for fresh graduates to gun for a decent salary if they work in civil engineering or quantity surveying. What was interesting to note is that either turnover rates were high in all of the jobs listed above, or many of the popular jobs on Jobstreet right now are taking in new blood into their workforce. And if you keep a few caveats and circumstances in mind, based on the jobs we looked at, it’s possible for many fresh graduates to seek salaries at or above RM2,500. This fact seems to put a different Jobstreet survey into a different light. According to a Jobstreet survey in 2016, 60% of fresh graduates seek an RM3,500 salary for their first job. A quick rule of thumb? If your industry is on the rise, then you’ll have a chance to ask for a higher starting salary. And have the skills to back up this request, of course. Otherwise, those looking for jobs in graphic designing or potential audit assistants may have to settle for the RM2,500 average salary after all. You can try out Career Insights here.